4-Hour course that will teach you and a guest the essentials of protecting yourself and your home along with safety and handling of firearms. A certified instructor for the National Rifle Association will teach you and a guest what you need to know about defending yourself and your home with this 4 hour training course approved by the NRA and the Arizona Department of Public Safety (DPS) that will get you on your way to receiving your Arizona CCW Permit. This class also includes fingerprinting and Live-Fire Simulation using our state of the art Live-Fire Simulator. Note: At the conclusion of the class you will receive your NRA certificate and fingerprint card. You will NOT receive your CCW permit. It is your own responsibility to file the necessary application with The Arizona Department of Public Safety in order to complete the CCW application process. 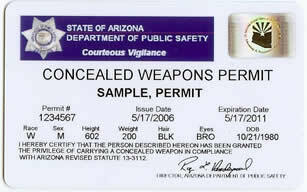 The NRA certificate you will receive shows DPS that you have completed the training required to apply for a CCW Permit. Completion of this training class does not guarantee that The Arizona Department of Public Safety will approve your application for a CCW. Be the first to review “4-Hour Arizona CCW Class For Two People” Click here to cancel reply.